I am willing to bet that you read that post title and thought "not so sure I care to read this one", but let me tell you, you will regret not! I've been thinking a lot lately about seasonal wall displays. My house is chock full of photos on the walls, and I'm struggling finding other art I like that I want to keep up year round (that is affordable too - framing odd sizes is expensive!). So the idea of having a seasonal framed display is interesting. It started with the ideas on specimen art. I like the idea of having the same frames up all year and just replacing the image in the frame seasonally. There is tons of easy printable art to be found (particularly on etsy!) and some is even free! 1. 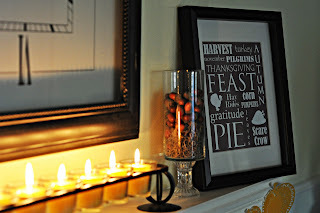 Check out this post by Craftily Ever After to download and print your own copy of this cute Thanksgiving subway art! 2. 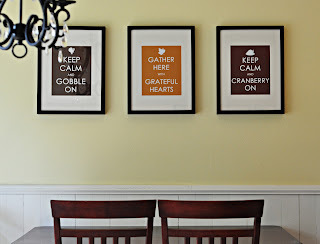 She also made these great Thanksgiving versions of the "Keep Calm" print. You can print your own here, here and here. 3. Yellow Mums offers these two great seasonal images for you to download and print for free. Love the squirrel! Or you can make your own with some pretty paper! 1. Here's a great idea from Write Click Scrapbook. The "thankful" word art is a free download! 2. And this one from eighteen25 shows Halloween paper, but who's to say a nice fall paper wouldn't work now? I'm such a sucker for buying pretty scrapbook paper and never wanting to cut into it! This display is a perfect use for that paper!